Home Biafra featured BIAFRA: WHAT DO THE "VICTORS" WANT? BIAFRA: WHAT DO THE "VICTORS" WANT? (A Phenomenal study of issues surrounding Nigeria existence). June 5, 2018 This work was inspired by three phenomenal topics. 1. The Aburi accord 2. The call for a restructuring of Nigeria 3. The Renaissance of the Biafra self-deterministic agitation. The facts surrounding Aburi accord is so clear that the smartest of the lawyers could not help but agree on the fact that the compromise of the conference was the straw that broke the camels back in the Nigerian union. In Aburi sometime in 1967, Gowon and Ojukwu opted for peace in the two nations (Biafra and Nigeria). It was a heavy task to reach an agreement but with the doggedness of the two young British trained soldiers and the intellectuals with them, a common ground was reached. Agreement meant to save Nigeria from bloodshed was signed. There was wide jubilation, men drank and ate together. But the implementation of the Aburi accord became a mere illusion, Igbos were still being massacred in the northern part of Nigeria, power remained concentrated in a central body. Ojukwu asked a question but the answer was more bloodshed. Biafrans had no option than to return home and declare for themselves a sovereign state, where their fundamental human rights will be respected and upheld. The call for restructuring was heard in quarters years after the war, the people after recovering from the agony of the war became eager again to go back to Aburi. (restructure) people want a change in the system so that humans can live as human other than animals. To this, the northern part of Nigeria unarguably stood up against this idea, as they are still doing today. They are ready to defend the status quo with their blood. In the same damnable Lugards empire, the Biafran people whom before the intervention of Britain in 1914 were living peacefully, solving their problems just like any other indigenous people wants to opt out from a Union they never agreed to be part of, but were forced at with guns and violence to be part of by Britain, led by Fredrick Luggard. These people rose up to determine their political, social and economic future, just like any other people of the world, they desired freedom in order to develop their land and have themselves a sustainable growth. This very move was met with violent opposition by the same Nigerian government that signed the Aburi accord a few months ago, the same Nigeria that is a signatory to international treaties on the upholding of the fundamental human rights of citizens of a member state. The same government that went to Aburi and signed all the signable accords and came to Nigeria to defy same agreement. they ended up chasing Biafrans down to Biafra land and massacre innocent populace. 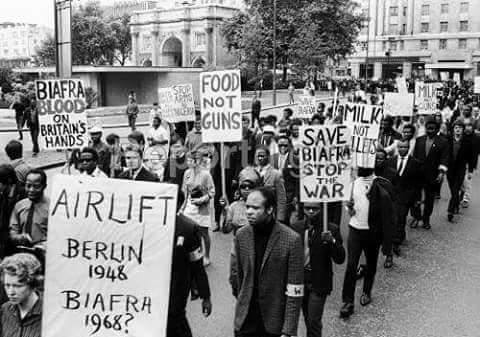 The same government that denied Biafra right to exist as a people in 1967 all in the name of unity, rose up to stand against the restructuring of the "one" Nigeria they preach. Now you refuse to grant Biafrans their right to enjoy the dividends of democracy You deny them the right to determine their future after pushing them out from Nigeria, what then do you the war victors want? You pushed us out of Nigeria that we singlehandedly built to whatever it is today and we accepted to start all over from the scratches but you are not satisfied rather you fight to demolish our very history from earth. That we must vehemently resist in all way possible. We have paid the ultimate price for Biafra freedom, we have no need for the pursuit of Nigerian restructuring any longer. The only thing that will make sense to our people is freedom and nothing but freedom. The only thing that we demand and the only thing we must get is total freedom from this country called Nigeria, we seek a nation where all man will be equal in the eyes of the law, we seek for a nation we can proudly call our own, we seek to rest in peace and appease the over 3.5 million killed doing the genocidal war, we seek to restore the country that thousands have so far died for in this latest Renaissance, we seek BIAFRA AND BIAFRA WE MUST GET.